Invasive weeds can be a really serious problem for the construction industry. They may also prove a barrier to the start of building works, as they cause damage to hard structures and can be a public health hazard. Official statistics highlight that invasive species cause £2.1bn worth of structural damage each year. The numbers of invasive weeds, and the spread of these non-native species in the UK, is growing and some areas are moving towards uncontrollable situations. We provide specialist weed removal services to the construction sector and are particularly acknowledged as experts in the total eradication of Japanese knotweed, which can be a real problem on many building sites. We’re members of the Property Care Association and offer insurance-backed guarantees of weed eradication for up to ten years. What Problems do Invasive Weeds Cause for the Construction Industry? 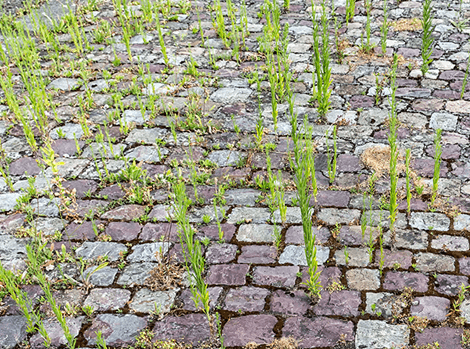 Within the construction sector, invasive weeds can damage structures, roads and paving if left untreated. Some of these weeds will grow through concrete, tar and masonry, and they can also grow into drains and pipes to cause flooding. The spread of these invasive weeds can entirely transform ecosystems and cause threats to native species. If invasive weeds are not eradicated, home builders will find it difficult to sell domestic properties to consumers as mortgage lenders will either decline a loan or place low valuations on these homes. This is an ornamental-looking plant which can grow up to three metres in height. It spreads via the development of a huge underground root system, with roots reaching a distance of up to seven metres from the plant and depths of up to three metres. This can be a difficult plant to eradicate as it often moves to a dormant state after treatment with herbicides, and can remain dormant for up to two years, with root systems able to remain dormant up to 25 years. Japanese knotweed is extremely invasive and is capable of causing significant structural damage. The weed is controlled by a number of environmental protection acts and it’s recommended that professional treatments are sourced for the eradication of any Japanese knotweed found on construction sites. Horsetail is another invasive species which can cause severe damage to roads and footpaths. This plant is resistant to treatment with weed killers and eradication by professionals is recommended. We are specialists in the eradication of Japanese knotweed and other invasive weeds for businesses in the construction sector. Our expert teams can help identify the invasive weeds on any site and offer clients a management plan for the treatment and eradication of any problem weeds. We provide guaranteed weed eradication treatments to ensure our clients within the construction sector are satisfied that these environmental hazards have been totally removed from their sites.